A few days ago, I was asked, “What’s the difference between chess and custard pies?” My answer: Chess pies, of which there are many flavors, belong to the custard pie family and are therefore just a custard pie by a different name. Most food historians agree that custard pie came to this country by way of English colonists who settled in New England and Virginia. A simple preparation, the basic custard pie is made from eggs, sugar, butter, milk or cream, and vanilla, baked in a pie shell until the mixture is set. Recipes can vary depending on the flavor desired. Puddings cooked on top of the stove until thick and creamy are also custards. When these puddings are poured into a baked and cooled pie crust to set, we refer to the results as a cream pie–a topic for another day. The one common element of all custard pies is that filling and crust are baked together. A few examples of custard pies include pumpkin, buttermilk, shoo-fly pie, and of course a whole family of chess pies. Another explanation suggests that these icons of the American south are so sweet that refrigeration was not necessary and were therefore stored in the kitchen pie chest. Chest pie when pronounced with a deep southern drawl soon became “chess” pie. I find this explanation the most plausible. While we may not be certain of its name, we do know there are references to chess pie as far back as 1877, when Estelle Woods Wilcox’s cookbook Buckeye Cookery included a recipe by Miss J. Carson on page 187. Some fifty years later a recipe for the modern chess pie appeared in 1928 in Southern Cooking by Henrietta. R. Dull. That same year, a chess pie recipe was published in the Fort Worth Women’s Club Cookbook. The major difference in a chess pie from other custard pies is most chess pie recipes call for a small amount of cornmeal (or sometimes flour) to be added to the batter. This step not only helps the pie set, but adds texture as well. Also, chess pie recipes usually include some type of acidity in the form of vinegar, buttermilk, or lemon juice to help balance its sweetness. I have included several chess pie recipes–the traditional version that uses only the four basic ingredients plus cornmeal, a slightly tart lemon chess, and a decadent chocolate chess pie. There is also a buttermilk chess pie and, of course, the classic pecan pie (yes, pecan pie is a member of the chess pie family). But a search through most community and church cookbooks will probably result in many more recipes for this simple yet delicious pie. When making a chess pie (and any custard pie for that matter), just remember one golden rule: The successful chess pie is baked low and slow. Rushing a chess or custard pie by increasing the oven temperature will curdle the eggs, causing the pie to be watery. It may also cause a thin, ugly and nasty tasting crust to form over the top of the pie. So there you have it, the difference in a chess and custard pie basically comes down to one ingredient–cornmeal. Make Em: Traditional Chess Pie, Lemon Chess Pie, Chocolate Chess Pie, Buttermilk Pie, Sweet Tea Pie, Classic Pecan Pie. Some of my fondest childhood memories revolve around the daily meals my momma prepared for our family. Momma (or “Sugar” as everyone called her) was an Oklahoma farm girl and a terrific homemaker and fantastic cook who always seemed to enjoy maintaining a fastidiously clean house and caring for my father, younger sister, and me. This included preparing our favorite treats, usually on a weekly basis. For me this meant her coconut layer cake with crushed pineapple between the layers and creamy white icing, her Thanksgiving sweet potato pies (which for years I thought were pumpkin), and probably my all-time favorite, homemade apricot fried pies. I was about eight or nine years old when I first became interested in how Sugar went about making these delectable hand-held treats, as this was about the time in my life that I had the growing desire to learn to cook. She would start about mid-morning making the filling–dried apricots, sugar, a touch of cinnamon, and water, simmered until the fruit was tender. She then added a lump of butter, mashed the mixture by hand with a potato masher into a sort of lumpy puree and set it aside to cool while she made the crusts. Early on Sugar’s fried pie crust was made from a biscuit-style dough, which as I think back was a bit ironic since she very seldom made biscuits. She would roll out the dough into a large rectangle about an eighth of an inch thick, and then, using a tea saucer as her pattern, cut it into circles about six inches in diameter. Gathering up all of the scrap pieces of dough, she reformed it, rerolled it, and cut more disks, continuing the process until every bit of dough was used. 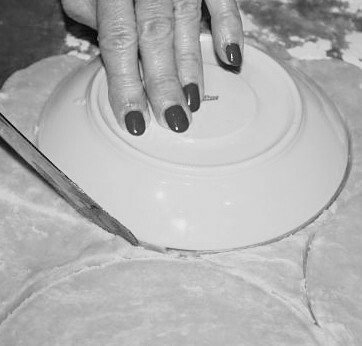 Later with the advent of canned biscuits, and being the progressive cook she tried to be, Sugar just couldn’t pass up the convenience of popping open one of those cans and rolling each glob of dough into its own circle. But with that exception, the ritual remained the same, filling half of each circle with the cooled apricot filling prepared earlier. 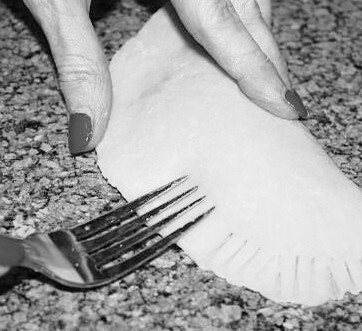 She then folded over the other dough half, carefully sealing each pie by crimping them with the tines of a moistened fork, and frying them in a large cast iron skillet of Crisco. OMG, a snack! Eating one of those treats made me feel as though I had died and gone to heaven. For those of you who may not be familiar with these little pockets of deliciousness, let me provide a little fried pie history, albeit a rather sketchy one. 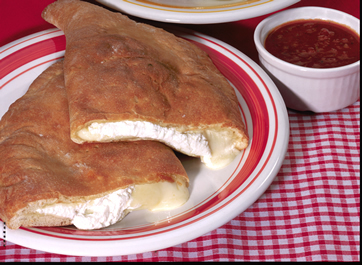 Research provides very little as to the when, where, and by whom fried pies were first created. 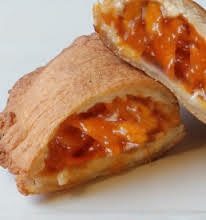 Some claim they descended from New Hampshire’s crab lanterns, a fried apple pastry whose name is derived, according to the Encyclopedia of American Food and Drink, from “crab apple” and “lantern,” because of the “ventilating slashes that expose the fruit filling.” And some believe them to simply be a southern version of the turnover, born out of the leftover pie crust from making a traditional pie. In truth, both these and other speculations as to the pastries origin probably have some merit. 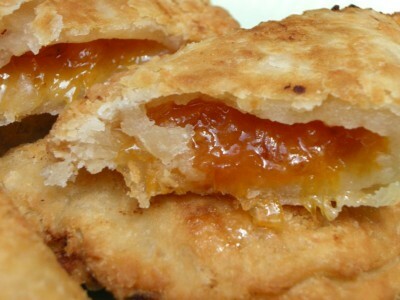 The fact is, various cultures from around the world have made “hand pies” for centuries. 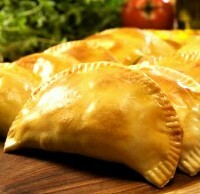 Spain and Portugal have had their empanada, since at least the 1500s, the Indians their meat-filled samosa, the Italians, their cheese filled calzones, the English their savory pasties, and Poland, their meat and vegetable pierogi, just to name a few of the more prominent of these portable meals and treats. History also shows that while these are most commonly of a savory nature, they can actually be filled with almost anything including fruits, berries, and jams. So while we may not be able to pinpoint the exact origin of the fried pie, we can be certain they are an American South tradition with generations of passed down recipes. And although apple and peach are the most common, I can assure you that other popular flavors including cherry, lemon, chocolate, coconut, blueberry, and of course apricot are equally delicious. 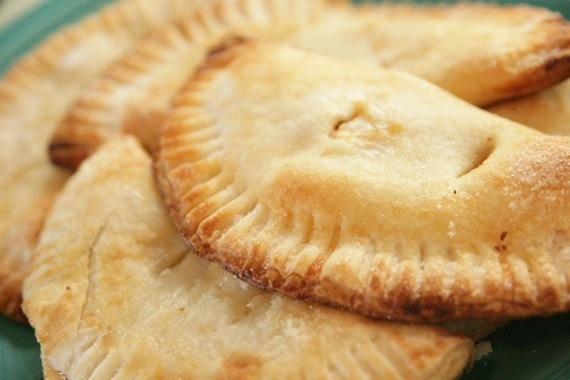 Fried pies are available at travel stops, convenience stores, BBQ joints, and some fast food restaurants across the southern states from Texas and Oklahoma to the Carolinas. But make sure that what you’re getting is a real fried pie and not one of the commercially branded baked pies, because they are definitely not the same. Better yet, try making your own from Sugar’s recipe which I’ve copied into the GrubAmericana recipe index. I know she’d be honored.